For other uses of the term, see Stage (disambiguation). The Battlefield stage in Super Smash Bros. Ultimate is an example of a typical stage in the Super Smash Bros. series. A stage (ステージ, Stage), also called a level, map, arena, stadium, or board, is a location in which characters fight or complete objectives. The word "stage" refers to a versus mode stage, but can also refer to the ground or large central platform within this location. As well as versus mode stages, single player mode stages, such as the Target Smash ones, exist for purposes other than fighting. 3.1 In Super Smash Bros.
4.1 In Super Smash Bros. In all of the games of the Super Smash Bros. series, most versus mode stages are available from the start, while a small number must be unlocked by completing certain objectives. 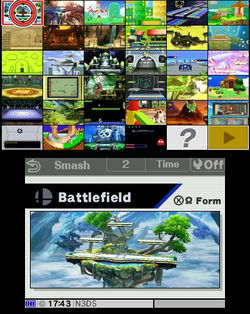 Some stages in SSB4 were made available through updates and are downloadable. Of these stages, only two are free. Most stages, like Princess Peach's Castle, are derived from places in playable characters' universes. Super Smash Bros. Melee introduced two Super Smash Bros. universe stages — Battlefield and Final Destination. In Super Smash Bros. Brawl, stages derived from games without associated playable characters were introduced, namely Smashville and Hanenbow, while PictoChat represents a Nintendo DS utility interface. Additionally, not every playable character has a stage from their own universe, the Fire Emblem universe lacked one in Melee (though one was planned), and the R.O.B. universe has, for unknown reasons, never had a stage. Included in all games other than the first are a small number (large number in Smash Wii U and Ultimate) of Past Stages — stages from a previous Smash game. These stages will have either no or minor alterations, an example being Dream Land (64) in SSB4, where the top blast line is much closer to the stage then it was in 64 or Melee. Ultimate changes this, giving various stages a more refined and detailed design. Stages range in size from the large The Great Cave Offensive and Rumble Falls to the small Yoshi's Story and Peach's Castle. Typically, stages involve a large central platform with ledges, multiple smaller platforms, as well as blast lines above, below, and to the left and right of the visible area. Some stages, such as Mushroom Kingdom and Coliseum, have floors that continue past the edge of the visible area and pass through a side blast line, these edges are known as "walk-off edges" or "walk-offs", because characters can walk offscreen without the need to become airborne. Stages with walk-off edges on both the left and right, like Bridge of Eldin, are referred to as "walk-off stages", and only a select few, like Yoshi's Island, have only one walk-off. Some walk-off stages, such as Onett, have lower blast lines that are inaccessible normally, while others, such as Green Hill Zone, only infrequently have the lower blast lines introduced; still others, such as Mushroom Kingdom, have permanently-accessible gaps where players can fall past the lower blast line while still having solid ground covering most of the lower blast line, including its intersections with the left and/or right blast lines. In Melee, moving and transforming stages were introduced. Big Blue and Rainbow Cruise consist entirely of platforms that move or appear on and offscreen, while stages like Icicle Mountain and PAC-LAND scroll continuously up, to the side, or down. Other stages, such as Pokémon Stadium, undergo partial transformations at certain intervals, while yet others, like Brawl's Castle Siege and Smash 3DS's Paper Mario, cycle through complete transformations. Similarly, stages like Delfino Plaza and Skyloft will take players to various areas via moving platforms. Mushroomy Kingdom may be one of two stages either randomly or based on a player's input prior to the match. Tortimer Island's, Gamer's, Balloon Fight's, and Garden of Hope's layouts are randomized to varying degrees for each battle as well. Other stage elements include breakable barriers and platforms, such as the pillars of Luigi's Mansion and the stone floors of Skyworld; stage hazards and enemies, such as lasers, cars, and Klaptraps; local items such as apples; and interactive objects such as Barrel Cannons and switches. While water has no effect on movement in Melee outside of the flowing river in Jungle Japes, Brawl introduced swimming, and some of its stages involve water that can be swum in. In Brawl and Smash 4, the appearance of some items, namely crates and barrels, differs depending on the aesthetic style of the stage they appear on. In all games, some stages (and in SSB's case, all but one) are banned in competitive play because they are considered disruptive or unfair. See stage legality. ↑ Listed as "Special Stages: Battlefield" in Melee. ↑ 2.00 2.01 2.02 2.03 2.04 2.05 2.06 2.07 2.08 2.09 2.10 2.11 2.12 2.13 2.14 2.15 2.16 2.17 2.18 2.19 2.20 2.21 2.22 2.23 2.24 2.25 2.26 2.27 2.28 2.29 2.30 2.31 A stage with the same name and layout appears in this game, but it has a different appearance. ↑ Listed as "F-Zero Grand Prix: Big Blue" in Melee. ↑ Listed as "Planet Zebes: Brinstar" in Melee. ↑ Listed as "Planet Zebes: Brinstar Depths" in Melee. ↑ Listed as "Lylat System: Corneria" in Melee. ↑ Listed as "Past Stages: Dream Land" in Melee. ↑ Listed as "Dream Land" in Smash 4. ↑ Listed as "Mario Circuit" in Brawl, and as "Mario Circuit (Brawl)" in Smash 4. ↑ Listed as "Special Stages: Final Destination" in Melee. ↑ Listed as "Superflat World: Flat Zone" in Melee. ↑ 12.0 12.1 12.2 12.3 Appears as part of Flat Zone X. ↑ Listed as "Dream Land: Fountain of Dreams" in Melee. ↑ Listed as "Eagleland: Fourside" in Melee. ↑ Listed as "Termina: Great Bay" in Melee. ↑ Listed as "Dream Land: Green Greens" in Melee. ↑ Listed as "Infinite Glacier: Icicle Mountain" in Melee. ↑ Listed as "DK Island: Jungle Japes" in Melee. ↑ Listed as "DK Island: Kongo Jungle" in Melee. ↑ Listed as "Congo Jungle" in 64, and as "Past Stages: Kongo Jungle" in Melee. ↑ Listed as "Mushroom: Kingdom" in Melee. ↑ Listed as "Mushroom: Kingdom II" in Melee. ↑ Listed as "F-Zero Grand Prix: Mute City" in Melee. ↑ Listed as "Mute City" in Smash 4. ↑ Listed as "Eagleland: Onett" in Melee. ↑ Listed as "Mushroom Kingdom: Princess Peach's Castle" in Melee. ↑ Listed as "Kanto Skies: Poké Floats" in Melee. ↑ Listed as "Kanto: Pokémon Stadium" in Melee. ↑ Listed as "Mushroom Kingdom: Rainbow Cruise" in Melee. ↑ Listed as "Yoshi's Island" in 64, and as "Past Stages: Yoshi's Island" in Melee. ↑ Listed as "Hyrule: Temple" in Melee. ↑ Listed as "Lylat System: Venom" in Melee. ↑ In Super Smash Bros. for Nintendo 3DS, Wily Castle is set during the day and has a variety of moving platforms. ↑ In Super Smash Bros. for Wii U, Wily Castle is set during the night and has platforms moving along rails, as well as the Yellow Devil. ↑ In Ultimate, Wily Castle is set during the night and has the hazards from both versions of Smash 4. ↑ Listed as "Yoshi's Island: Yoshi's Island" in Melee. ↑ Listed as "Yoshi's Island: Yoshi's Story" in Melee. The stage select screen in Smash 64. There are nine versus stages in the original Super Smash Bros., eight starters and one unlockable stage: Mushroom Kingdom, shown in bold. The stage select screen in Melee. There are 29 versus stages in Super Smash Bros. Melee, 18 starters and 11 unlockable stages, shown below in bold. The three past stages are unlockable. The stage select screen in Brawl. The Melee Stages screen in Brawl. There are 41 versus stages in Super Smash Bros. Brawl, 29 starters and 12 unlockable stages, shown below in bold. None of the original Super Smash Bros. stages return, but there are 10 stages from Melee, one from each universe involved in the original Super Smash Bros. 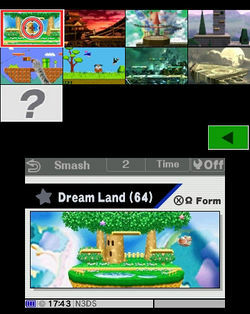 The stage select for Super Smash Bros. for Nintendo 3DS, showing the normal stages. The stage select for Super Smash Bros. for Nintendo 3DS, showing the extra stages. The stage select for Super Smash Bros. for Wii U, showing the normal stages. The stage select for Super Smash Bros. for Wii U, showing the extra stages. Stages in Super Smash Bros. 4 differ depending on the version. Super Smash Bros. for Nintendo 3DS features 42 stages total, 7 of which are unlockable, shown in bold, and 8 of which are downloadable content. Super Smash Bros. for Wii U features 55 stages, 6 of which are unlockable, shown in bold, and 9 of which are downloadable content. Bold and italic text denotes stages that are unlockable in one version, but a starter/downloadable stage in the other. 13 stages appear in both versions (with some having changes), however the majority of stages are exclusive to each version, with 3DS stages primarily pulled from handheld games and Wii U stages from console games (though, there are some exceptions). In addition, this is the first game where stages from all the past entries return at once. All stages now have an optional Ω form (Omega Form), changing their layout to be similar to Final Destination - some have walls that go all the way down to the bottom blast line, while others are basically floating islands. Unique to Smash 4 is the disabling of Star KOs and Screen KOs on certain stages. The stage select for Super Smash Bros. Ultimate, showing the normal stages. The stage select for Super Smash Bros. Ultimate with Stage Morph enabled. There are 104 versus stages in Super Smash Bros. Ultimate, with four more planned to be future downloadable content. 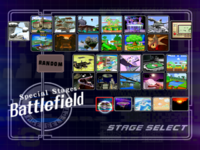 8 stages are unique to Ultimate while the other 96 comprise nearly every stage from previous Smash games: 7 from Super Smash Bros., 19 from Super Smash Bros. Melee, 26 from Super Smash Bros. Brawl, and 44 from Super Smash Bros. 4 (18 from the 3DS version, 18 from the Wii U version, and 8 that are in both versions). Ω forms return for each stage, along with a new Battlefield form for every stage. All Battlefield and Ω forms have the same size and terrain as Battlefield and Final Destination, respectively. Up to 8 players are supported on every stage. 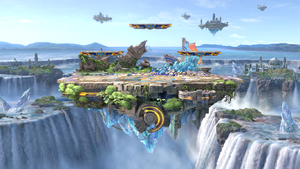 Not counting either single-player only stages or previous versions of Battlefield and Final Destination, there are only 15 stages that do not return in Super Smash Bros. Ultimate; 2 from Smash 64 (Planet Zebes and Sector Z), 4 from Melee (Icicle Mountain, Mute City, Mushroom Kingdom and Poké Floats), 2 from Brawl (Rumble Falls and PictoChat), 2 from Smash for 3DS (Rainbow Road and Pac-Maze), and 5 from Smash for Wii U (Miiverse, Woolly World, Orbital Gate Assault, Jungle Hijinxs and Pyrosphere). A new rules option allows stage hazards to be turned off. Stages are ordered by when they first appeared in the Super Smash Bros. series. Unlike previous entries, all stages are available from the start. Ultimate also introduces Stage Morph, an option which allows players to choose two different stages which will transition back and forth over the course of a battle. In the single player modes and challenges, a number of stages appear that are not available in versus mode without hacking or accessing it via the Debug menu. The Home-Run Contest stages in Melee, Brawl, and SSB4 involve a central platform from which Sandbag is hit, and a very long stretch of ground to the right of the platform for it to land upon. In Melee's "trophy tussle" event matches, the player fights CPUs upon a stage that takes the form of a giant object, the trophy for which he or she wins after completing the event. The original Super Smash Bros. Board the Platforms stages function as agility tests, and there are 12 in total - each one is designed to challenge the player's character. Like Board the Platforms, Break the Targets and Target Test stages of the original Super Smash Bros. and Melee respectively are tailored to challenge each character - 12 exist in the original and 25 in Melee. Some of Melee's Target Test stages are decorated in reference to their character's universe; Pikachu's, for example, has decorative Poké Balls in its walls, while the Ice Climbers' look like a level from the game Ice Climber. Brawl, however, simply has five Target Smash! stages for all characters, each representing a different difficulty level. Areas in Adventure Mode and the Adventure Mode: The Subspace Emissary are technically defined as stages. The Online Practice Stage in Brawl, SSB4, and Ultimate is playable only while waiting for an online match to load. The controls test stage in Brawl, SSB4, and Ultimate is playable only for the purpose of testing custom controls, and only as Mario. All-Star Rest Area - The stage the players are teleported to and from between All-Star Mode matches. Entei - the stage on which Event 26: Trophy Tussle 2 is played. Goomba - the stage on which Event 14: Trophy Tussle 1 is played. Majora's Mask - the stage on which Event 47: Trophy Tussle 3 is played. Race to the Finish - a Classic Mode bonus game stage. Snag the Trophies stage - a Classic Mode bonus game stage. Target Test stages - a set of single player mode stages that also appear in Classic Mode as bonus games. Note: In Brawl, most of these stages can be played with two players. Target Smash! stages - a set of single player mode stages that also appear in Classic Mode as bonus games. Note: As with Brawl, most of these stages can be played with two players. The Credits - A small stage where the player smashes names to reveal a picture. Trophy Rush stage - Raining blocks appear on the stage. If they are too far up, the stage will disappear and KO the player. Target Blast Stadium - A stage similar to the Home-Run Stadium. The player breaks the targets by smashing a bomb at them. SSB4's Online Practice Stage - Same as Brawl, but the Wii U version looks like an Ω form of the Miiverse stage with a Sandbag; the 3DS version's shape bears more of a resemblance to Ω Battlefield, but with different and simpler textures. SSB4's control test stage - Same as Brawl. Note: As with Brawl and the Wii U version, some of these stages can be played with two players. Galleom, Rathalos, Marx, Dracula, and Ganon’s boss stages. Galeem and Dharkon's forms of Final Destination. The general layout is the same for all three variants, but the backgrounds are different for each one, with the last variant featuring 4 unique backgrounds depending on which boss is still alive or close to death. Scrolling stage used only in the Final Battle. SSBU's Online Practice Stage: Resembles the Battlefield-shaped portion of the Training stage. SSBU's control test stage - Same as Brawl and SSB4. The unique versions of Battlefield forms exclusive to Mob Smash. Touring or transforming stages locked to certain areas used in Spirit Battles. Some stages are inaccessible through normal means. These non-playable stages are accessible only through the use of hacks and debug programs, such as Action Replay. Some, such as "Test", were presumably used for testing during game development, while others, such as the "Tutorial stage", are used in the game but not for the purpose of gameplay. 1-Player Mode Credits - the file name of the single player mode credits is "STGCHARACROLL.pac", which technically defines it as a stage. Results Screen - the results screen that appears after a match is a stage, playable only through hacking. Photo Studio backgrounds - The backgrounds are all considered separate stages, and can only be played by hacking. Brawl introduced the Stage Builder, a tool that allows players to build their own stages, for use in multiplayer matches, using sets of provided objects, some unlockable. Brawl includes a set of Sample Stages that were built using the Stage Builder. The stage builder can also be used to build No KO stages and "CD Factories" - exploitative stages used for quickly obtaining CDs. The Stage Builder returns in Super Smash Bros. for Wii U, with some features removed and other features added. In version 3.0 of Super Smash Bros. Ultimate, the stage builder was released. If the language is set to Latin American Spanish or Canadian French, all logos will use their US English version. If the language is set to Castilian Spanish, Parisian French, UK English, German, or Italian, all logos will use their properly translated European versions. If the language is set to Korean, games not released in South Korea use an inconsistent mixture of Japanese, US English, and UK English logos, for example using the UK English logo for Xenoblade Chronicles, the US English logo for Fire Emblem Awakening, and the Japanese logo for Super Mario USA and Made in Wario. If the language is set to Traditional or Simplified Chinese, a different inconsistent mixture appears, such as using the UK English logo for Tomodachi Life and the Japanese logo for Xenoblade Chronicles. As a unique difference between Simplified and Traditional Chinese, Simplified Chinese translates the logo for Nintendogs into Chinese, while Traditional Chinese leaves the logo untranslated. If the language is set to either Japanese or Chinese, the origin game for Magicant is listed as Mother. If the language is set to Korean or any Western language, the origin game is instead listed as EarthBound (and not EarthBound Beginnings), despite those being two completely different games. The logo for the game Find Mii is the only one to differ in all 11 languages. Port Town Aero Dive has its origin game listed as both F-Zero GX and F-Zero AX, and is the only stage to list more than one title outside of Pokémon series stages. This page was last edited on April 24, 2019, at 04:07.